Nine species of bats are considered regular residents of New Jersey. These include the little brown bat, big brown bat, northern long-eared bat, small-footed myotis, Eastern pipistrel, Indiana bat (state and federally endangered), hoary bat, red bat and silver-haired bat. The hoary, red and silver-haired bats are part-time residents that are found here from spring through fall when they migrate to southern states for the winter. The other six species remain here throughout the entire year and require special habitats for winter hibernation. Natural caves once provided hibernating habitat for bats, but today most caves are subject to disturbance by people and thus are not suitable for use by bats. Abandoned mines and tunnels have replaced natural caves as the primary winter habitat for bats in many parts of the country because they are often unsafe to enter or inaccessible to people. In July of 1994, the Endangered and Nongame Species Program successfully negotiated a long sought after agreement with landowners to install a special bat conservation gate to keep people out but allow free access by the bats. The gate was designed by Roy Powers of Virginia and constructed through the joint efforts of Powers, the ENSP, the US Fish and Wildlife Service and Bat Conservation International. Shortly after the gate was installed the state acquired the property through the Green Acres Program and it is currently part of the Wildcat Ridge Wildlife Management Area and is listed as a Watchable Wildlife Site. The ENSP conducts a biennial winter survey to assess the bat population in the Hibernia Mine. The most recent survey occurred in February 1999 when more than 30,000 bats were counted - the largest total since bat surveys began in the mine. Beginning in 2003, a Summer Bat Count was begun to document summer roosting locations throughout New Jersey and help to create a range map for the state's nine species of bat. The information will also help to determine roosting and foraging requirements and contribute to the protection of bats in New Jersey. In 1997, the ENSP began a project to search for and protect additional mines and tunnels that support wintering bat populations. A number of new hibernacula have already been located and efforts are underway to protect them. 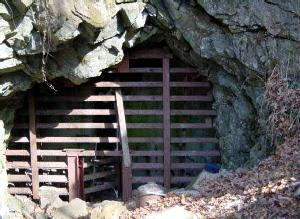 In November 1999 a bat conservation gate was constructed and installed over the entrance to a tunnel in Worthington State Forest in Warren County. The gate was completed through the cooperative efforts of the ENSP, the Division of Parks and Forestry and the US Army Corps of Engineers. The site currently supports several hundred wintering bats but has the potential to support a much larger population. Time will tell if protecting the bats from human disturbance will allow the wintering population to increase. The ENSP will continue to search for and protect habitats that are important to bats.